Thanksgiving: a day for family, friends, food, and questions. Do you have enough space for everyone to sit? How will you prepare the turkey? Do you stuff the turkey? Will you prepare a vegetarian option? What wine will your serve that could possible go with the variety of food being served? Typically food and wine pairings will focus on a single wine and a single dish, but Thanksgiving is an entirely different ball game with all the variety that fills our plates at this annual feast. 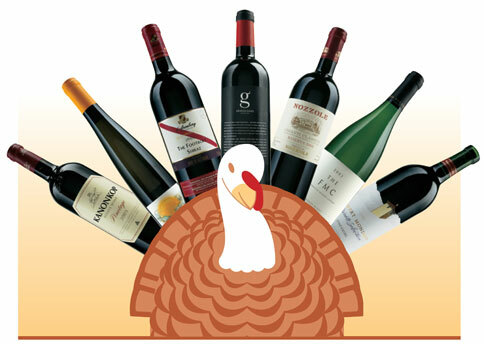 Typical suggestions for Thanksgiving wines include pinot noir (a fruity red) and Gewurztraminer (a fruity white) and while these are not bad choices they represent the predictable and safe choices. In that respect wine should be the least of your concerns when Thanksgiving rolls around. Any good wine will match something on your menu and most likely will actually go with the majority if not all of your menu. In fact this makes Thanksgiving as good a day as any to experiment and discover new and interesting food-wine combinations. Voters in Keego Harbor, Michigan joined voters in Colorado and Washington among other states on November 3rd when they voted to legalize the use and possession of marijuana for adults. The passing of the proposal legalized the “usage, possession, and transfer,” of an ounce or less of marijuana by anyone 21 or older within a private, non public space. The proposal passed with 55% of the vote. Keego Harbor in Oakland County became the sixth community in the county and more than the dozenth within the state of Michigan to either legalize marijuana possession for adults or to make the drug their community’s lowest law enforcement priority. A similar proposal to the one passed in Keego Harbor also passed in the Kalamazoo County city of Portage on the 3rd as well. For the third time in four years voters in Colorado were asked to vote on how to spend marijuana taxes on Tuesday. Back in 2012 voters approved amendment 64 to legalize marijuana and in 2013 the approved Proposition AA to allow sales and excise taxes to be used on sales of the drug. With both of those elections voters supported sending $40 million in tax dollars toward school construction. This time voters overwhelmingly approved Proposition BB that once again allows for lawmakers to spend approximately $66.1 million in taxes collected from the sale of recreational marijuana. The proposition received roughly 69% support from the voters, which was no surprise given the bipartisan support it had from state officials. Proposition BB will send the first $40 million in revenue to school construction, $12 million will be designated for youth and substance abuse programs, and an additional $14.1 million will be put into discretionary accounts controlled by lawmakers. When Halloween comes to mind there are two things we immediately think of, tricks or treats. Which makes this one of the busiest times of year for bakeries and chefs looking to make the most this haunted time of year with spooky treats of their own. After all generic, store bought candy may be the most common treat you see on Halloween, but that doesn’t make it the best and certainly not the tastiest. With that in mind here’s 5 spooky treats that will certainly make your bakery the place to go for Halloween treats or your party the highlight of your guests Halloween.